Bird treats ebook for you! I’ve heard this so many times when people are trying to get their parrots to start eating better. The biggest motivator is to be able eat with you. If you are eating the healthy foods, chances are your parrot will be more than happy to eat some of it too. (Remember, it always tastes better if it’s on your plate, instead of in their bowl.) Have a nice salad with them to encourage them to eat their veggies and greens, add fruit and nut pieces to make it even more enticing to them. Be creative with your meals to include healthy whole foods that you, your family, and your parrots will all be able to enjoy. Change the ingredients that you use each time you make something. This is just a guide to give you ideas. 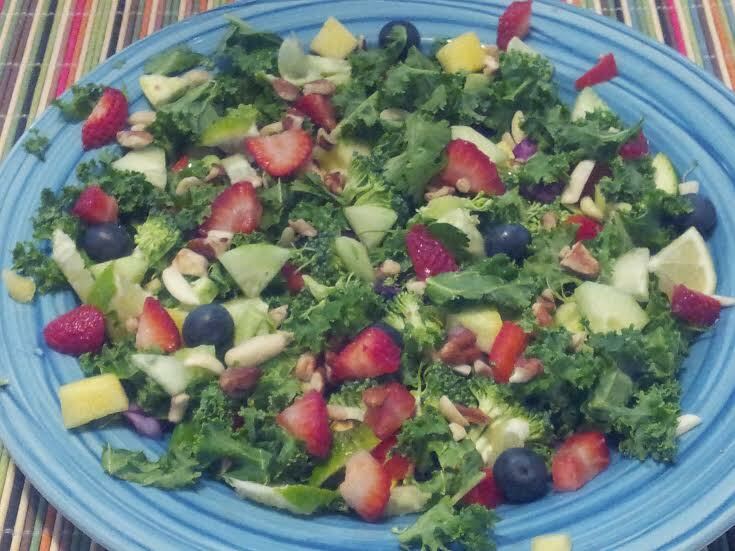 Ingredients for this batch are kale, cucumber, red bell pepper, cilantro, mango, blueberries, strawberries, zucchini, yellow squash, red cabbage, pecan pieces, almond slivers and fresh squeezed lime. Next up, mango salsa, oh yum!!! Another favorite around here is fresh mango salsa. I make a special version of this salsa for the parrots when I make it for the family. Everyone really enjoys this one. Again, try different ingredients for it each time that you make it. 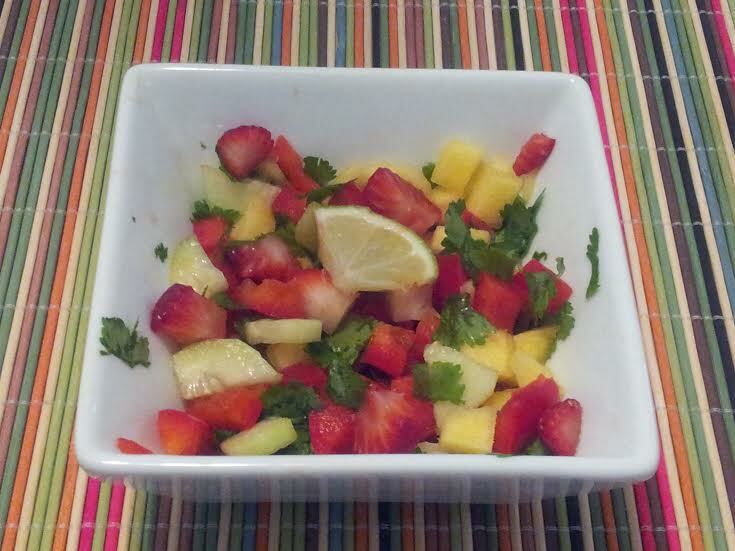 This batch includes mango, strawberry, cucumber, red bell pepper, cilantro and fresh squeezed lime. The parrots get excited when they see me in the kitchen preparing a special feast for family and friends. They look forward to getting something special to eat too. And offering meals with a variety of different foods, colors and textures provides enrichment for them. Be creative, and make a fun, healthy meal for you and your parrot to be able to eat together. 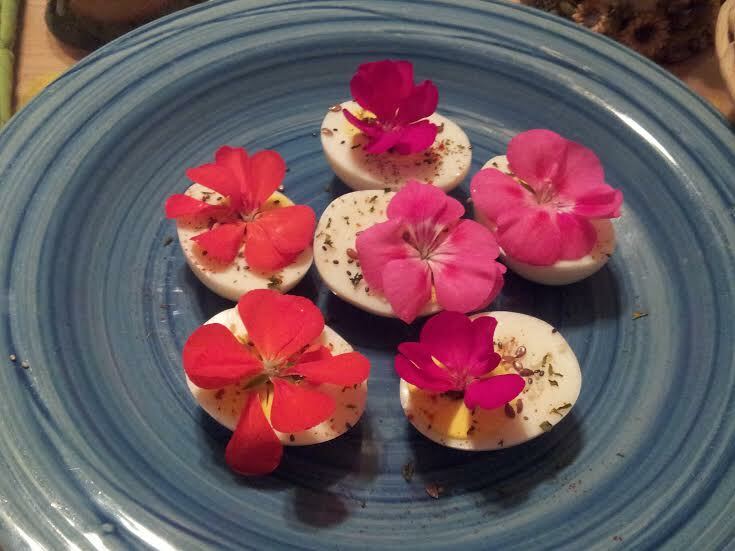 Simple, but fun meal, of hard boiled eggs with a sprinkle of paprika, dried parsley, flax, chia and sesame. 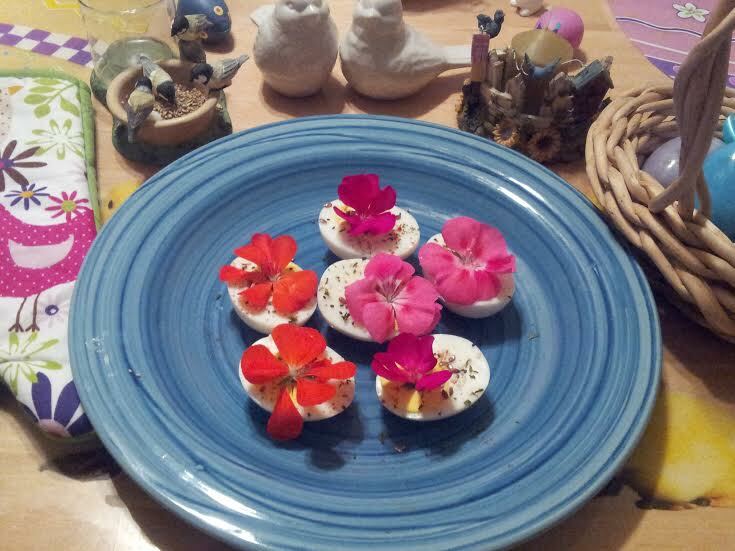 Topped with edible flowers, geraniums. 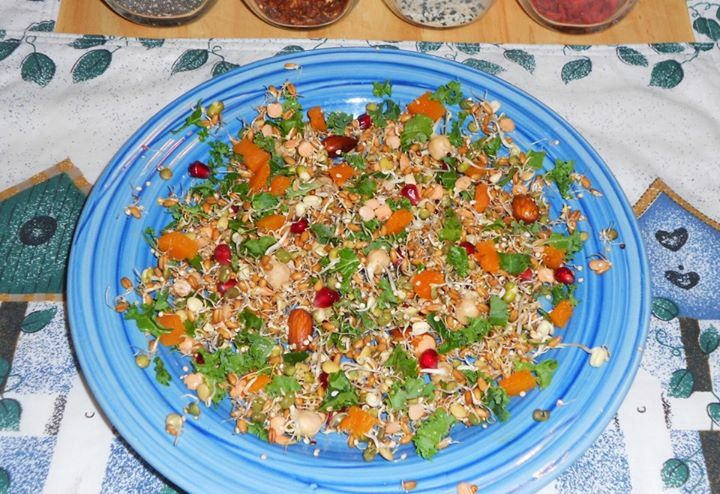 Sprouts: soaked almonds, black, white and red quinoa, wheat berries, red and green lentils, mung and adzuki beans. 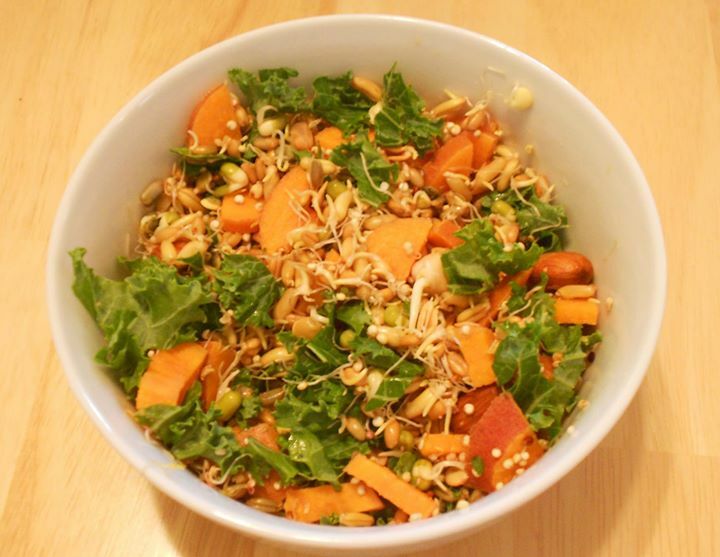 Raw kale, baked butternut squash and fresh pomegranate. Chia and sesame seed sprinkled on top. Sprouts salad for the fids. 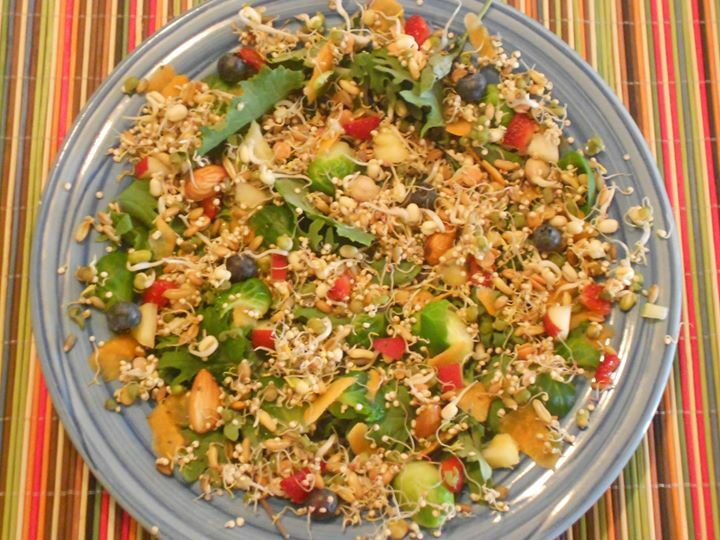 Raw sprouts: quinoa, kamut, wheat berries, rye, mung beans, garbanzo beans, red, green and blue lentils, soaked almonds. Raw greens: kale and dandelion. Lightly cooked veggies: brussels sprouts and sweet potato. Fresh fruit: apple, blueberry, strawberry and pineapple. Chia seed sprinkled on top. Mix it all up and spread your batter in a thin layer into a lightly oiled baking dish. (I use extra virgin organic coconut oil on a shallow glass baking pan.) I bake all of my treats at 350 F. They were ready in twenty minutes, but I chose to cut them out with the cookie cutter and then flip them afterwards for another fifteen minutes for the fun shapes. 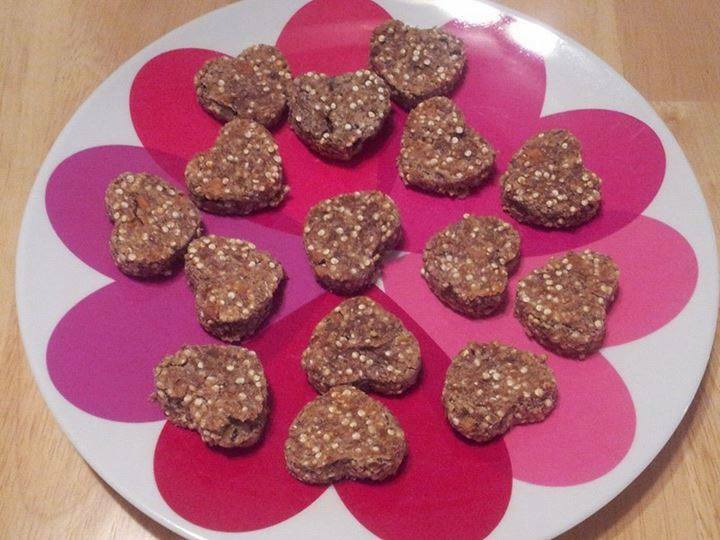 Another fun, easy recipe: Blueberry sweet potato sweetheart treats.